Growing petrochemical industry, expansion of industrial sector along with upcoming infrastructural projects are some of the key factors which would fuel the growth of Saudi Arabia Electric Drives market over the next six years. Further, expected recovery of oil prices would also increase government funding in oil & gas and petrochemical projects which would drive the demand for electric drives in the country. According to 6Wresearch, Saudi Arabia Electric Drives market size is projected to grow at a CAGR of 5.3% during 2017-23. Though, the market witnessed decline in 2015 and 2016 and the same trend is expected in 2017 as well, however, the market is likely to improve post 2017 due to anticipated recovery of oil prices. Changing government policies, economic diversification, expansion of automotive manufacturing as well as growth in petrochemical industry would fuel the market for electric Drives in Saudi Arabia. In terms of power rating, high power drives dominated the Saudi Arabia Electric Drives Market Share by revenues on account of their huge consumption in the oil & gas and petrochemical industry. Further, high power drives would continue to dominate during the forecast period. Amongst all end users, the Petrochemical, Chemicals and Fertilizers (PCF), Oil & Gas, Water and Utilities sectors dominated the market, where major growth is exhibited in the PCF and Water and Utilities sectors. The key players in Saudi Arabia electric Drives market include- ABB, Schneider, Siemens and Rockwell and Danfoss. 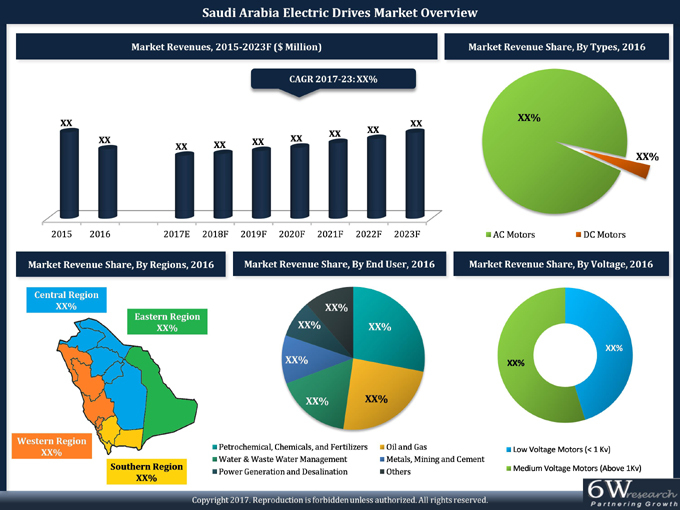 The Saudi Arabia Electric Drives Market report thoroughly covers the Saudi Arabia Electric Drives market by types, applications, end users and regions. The Saudi Arabia Electric Drives Market outlook report provides an unbiased and detailed analysis of the Saudi Arabia Electric Drives Market trends, opportunities/high growth areas, market drivers which would help the stakeholders to device and align their market strategies according to the current and future market dynamics. • Historical Data of Saudi Arabia Electric Drives Market Revenues & Volume for the Period 2015-2016. • Market Size & Forecast of Saudi Arabia Electric Drives Market Revenues & Volume until 2023. • Historical Data of Saudi Arabia Electric Drives Market Revenues & Volume by Types for the Period 2015-2016. • Market Size & Forecast of Saudi Arabia Electric Drives Market Revenues & Volume by Types until 2023. • Historical Data of Saudi Arabia Electric Drives Market Revenues & Volume by Voltage for the Period 2015-2016. • Market Size & Forecast of Saudi Arabia Electric Drives Market Revenues & Volume by Voltage until 2023. • Historical Data of Saudi Arabia Electric Drives Market Revenues & Volume by Power for the Period 2015-2016. • Market Size & Forecast of Saudi Arabia Electric Drives Market Revenues & Volume by Power until 2023. • Historical Data of Saudi Arabia Electric Drives Market Revenues by End User for the Period 2015-2016. • Market Size & Forecast of Saudi Arabia Electric Drives Market Revenues by End User until 2023. • Historical Data of Saudi Arabia Electric Drives Market Revenues by Application for the Period 2015-2016. • Market Size & Forecast of Saudi Arabia Electric Drives Market Revenues by Application until 2023. • Saudi Arabia Electric Drives Market Trends and Developments. • Saudi Arabia Electric Drives Market share, by Players. 15.1. ABB Electrical Industries Co. Ltd.